Having recently been following Hannah Witton’s ‘The HormoneDiaries’ and having a sudden surge in wanting to become environmentally friendly as best I can, I decided to jump on the bandwagon, and give the menstrual cup a go. So... I searched around and settled on the OrganiCup. The idea of menstrual cups is to help minimise the amount of sanitary waste whilst being much kinder to the female body. The OrganiCup is made purely of soft allergy-friendly silicone - no harsh chemicals. "OrganiCup is 100% free of bleach, glue, perfume, lotions or indeed anything that doesn't belong inside your body." 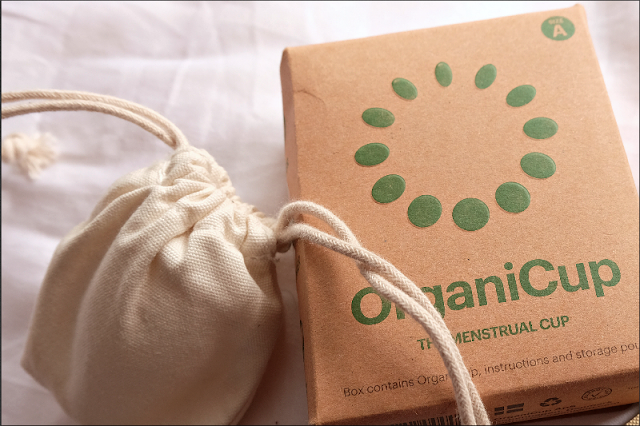 On the OrganiCup website, they provide plenty of information about their product, also supplying shocking statistics such as "the average women uses 11,000 pads or sanitary towels during a lifetime"... that's a lot of tampons people. This little thing, can last for up to 12 hours! This particular cup is vegan and hygienic and can hold up to three times the amount than pads and tampons - and the best part - these cups last for years! So no more panic runs to the local shop with make-do toilet-paper-towels to hurriedly buy some more super expensive, taxed tampons. It happened! Auntie Flow arrived, and for the first time ever… I actually felt excited. So I dashed to my bedroom and grabbed, what is now my super cute period pouch that I purchased on a whim in New Look a few months back - purely for the mermaid tail vibe it was giving me while I was in line at the checkout – and made my way to the bathroom. It took about three tries before it felt comfortable, and then I went about my day. I haven’t even noticed it once. It’s completely comfortable, so far I’ve had no leakages – I’m absolutely in love with my Organi-Cup so far! I would say I have a fairly heavy flow, and initially felt very unsure about leaving the OrganiCup in all day. After day one, I was feeling pretty confident, so day two, I wore it to London for the day – with no extra precautions. It was a risky move only after one day of trail. But it did not fail me. I could not believe that I had no need to empty it throughout the day – beforehand, when using tampons, I would get through 2-3 of the heaviest flow a day, at least – it was comfortable, I completely forgot about my period and felt so at ease. My second day, usually being my heaviest, breezed by. One thing is for sure, I do not miss tampons. And I do not miss the mess of sanitary towels! I continued to use the OrganiCup for the remainder of the week. I am unbelievably happy with the results, and will never go back to sanitary products. Alongside the OrganiCup being so much kinder to the environment, it will save a huge amount of money when it comes to buying taxed sanitary products, for 21 quid, this will last years, instead of hours. It's pretty safe to say, that the OrganiCup has become an absolute favourite, and that I don't even think twice when it comes to Auntie Flow visiting - tampons and sanitary towels are no more. I will never, ever go back. Menstrual cups all the way! I'll forever (well... until the menopause I suppose) be enjoying environmentally friendly, chemical free periods. I've been singing the praises of the OrganiCup and would highly recommend it to anyone.